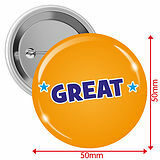 This orange pack of 10 button badges are the perfect reward to appraise pupils with! 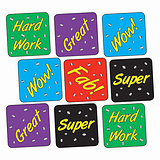 The word great is the key focus and is a great way to encourage children to work hard for the sticker! Great fact: We live in earth, but earth is the only planet in the solar system that is not named after a god.